Brooklyn For Peace and Fort Greene Peace, as well as friends and allies, gathered at the Barclay's Arena yesterday at noon. 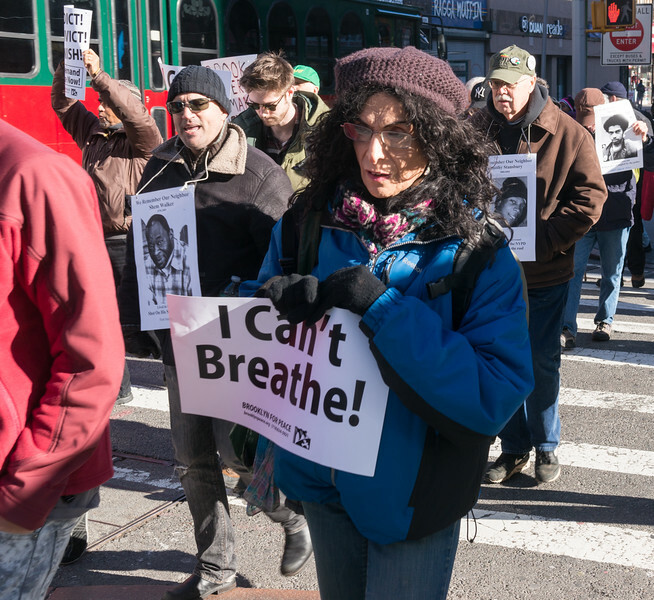 From there, several dozen marched up Flatbush Avenue and down Fulton Street with signs that remembered the many neighbors who have been killed over the years in Brooklyn by police infected with the virus of racism. The marchers then boarded the subway, bound for Manhattan's Washington Square to join the tens of thousands assembled there for the massive march that transformed the day into one for the history books. Thousands of New Yorkers took to the streets yesterday demanding an end to racist police violence and seeking justice for those who died at the hands of officers who are never held accountable for their illegal actions. The crowds of tens of thousands, diverse and overwhelmingly young, were a wonderful representation of New York and they were exuberant and militant in their demands: "No justice, no peace!" rang throughout Washington Square Park which is where they assembled at 2:00 pm on a blustery winter Saturday. The weather proved no deterrent as marchers left the park and headed up Fifth Avenue. "I can't breathe!" "Hands up, don't shoot!" were shouted out, echoing the dying words of Eric Garner and Michael Brown, whose deaths ignited the unending protests that have created, what seems to be, a new civil rights movement in our country - or at least a growing awareness by millions that something is terribly wrong with the so-called justice system in these United States and a determination to demand change to right that wrong. Here are some photos from this historic march in New York city. What was unclear or not understandble about "I can't breathe" ... uttered eleven times until dead?